I'm a qualified surgeon. I have spent many years dreaming of becoming a cyborg. I would love to be able to modify my body both functionally and aesthetically beyond which is possible today. My ideal goal would be to have my brain removed and implanted into a totally artificial body (I firmly believe that it would be impossible to upload a consciousness to a computer as this would merely be a copy rather than the original). I want to feel artificial. 3D sintering is a thing I imagine could be done to create parts a la 3D plastic printing. ^^ artificial hands, feet, limbs do exist. ~ integral with the body, doesn't need as much attention. I feel the same way, I've honestly felt below a below knee amp would be a good start too. But until tech gets at least close to a normal foot I really couldn't justify it. 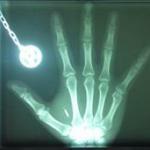 Have you looked into magnet implants? I've got one last year and it does fulfill some of these feelings of modifying your body for function. Nope, definitely not (med student here: hoping to become a neurosurgeon for the same reason). Though I thought that we're still a long way from being able to keep just the brain alive in a machine? So the idea is to take a real living brain and put it into some mechanical body? Given you'r a med student you can easily check on how many nerves/neurons you'll have to interface with to give your brain more than a mechanical shell in which your mind would sit in dark emptiness. Most importantly you'd probably want to wire up at least your optic nerve with a reasonably high resolution (you'd at least want those with more than 100k electrodes). Same for the cochlear nerve, a few thousand might work well enough. You'd also want to wire up some of the motoric and sensoric nerves running down your spine so you have an easier time interfacing. Like you can simulate an actual body and move your arms and stuff. Wiring up the motoric and sensoric nerves of the muscles moving your eyeballs would be very useful too. So once you'r done messing with the interfaces, you'd need ways to sustain your brains functionality. You probably know a lot more about that than I do but i guess you'll need to supply oxygen and sugar at least. So for the interfacing part you'd need a lot of custom made high density electrode arrays. Those do exist for smaller sizes but you'd need it on a massive scale. And a lot of electronics and custom made chips to read out and stimulate it. Creating custom silicon chips alone can easily set you back several million bucks for such a project. Long story short, it is frustrating but on a technological (electronics) level we could tackle the problem (with a bunch of failures on the way and lots of money lost). Not sure about sustaining the life and your mental health once you'r in a can of metal deprived of most sensory input. Btw I'd be really interested in knowing how well you can sustain a brain working without a body. so like ghost in a shell. surely the main bit would be the brainstem mould be very fiddly and the longer a brain is attached to a body the more used it gets and the higher the chance of rejection (just a prediction) so would work best on babies. mmm don't like that idea, free will and all but maybe with stem cells and bio-robotics you could do it, although I do like the idea of starting off with a leg, if I was to get one I would give it functionality like north sense. I would worry about reflexive stuff - particularly sensations like balance and breathing. You wouldn't want to wake up in your neat new robot body and feel like you are drowning all the time, or totally lose your sense of up and down (having control over it might be interesting; learning to orient entirely visually could be an advantage in martial arts, or in zero G, maybe). But you'd want some things to be there. I think having touch (to avoid feeling totally numb) and proprioception would be pretty big too. Heat and cold, maybe - feeling warm enough can be a comfort thing... etc. You could try and intercept the communication to start with. Nerves leaving the spine are neatly organized in sensoric and motoric groups. What you'd need is high density electrode arrays to read from nerves and stimulate them. To date, those exist to some extend but they are far from perfect. Resolution is limited and the circuitry to read and write those things is still rather bulky because there's hardly a profit to be made from producing highly specialized chips for such a task. Hey, I never said that it would be easy. :P Just like JF Kennedy said, except substitute "going to the moon" with "getting a mechanical body". Regards to some of the points raised here though: part of the idea is that there is no more immune system to bother about (instead, infection is prevented merely via isolation from the environment, which I can see some difficulty but not entirely impossible or else we wouldn't have a sterile room like an operating theatre), and thus there can be no rejection problem since that's entirely immune mediated. This also unfortunately might make the brain more vulnerable to other forms of injury, though how much I'm not too sure since it is quite immuno-isolated (not entirely as evidence is showing). Re: breathing - the brain picks up whether or not you need to breath more or less via detecting the pH and CO2 in the CSF, so as long as the life support system is keeping that constant (which it should since that's part of the point of the life support) there shouldn't be problems. Re: balance - the vestibular system actually works by interpreting the difference in between the signals going into the brain via the cochlearvestibular nerve, and the brain is surprisingly adaptable to changes in the signals anyway (ie, to the point that patients with chronic problems in the cochlearvestibular nerve, eg acoustic neuroma, can present with no vertigo at all). In fact, the plasticity of the brain is to the point that I'm curious as to how it would adapt to massive changes to the signals going into it when we put it in a mechanical body (obviously, it would need SOME signals going in since it will need so sense the surroundings somehow). Speaking of senses, another way of doing it would be to stimulate the cortex directly (eg: post-central cortex for senses, transverse temporal gyri for auditory, calcarine gyri for sight), though that would mean bypassing the thalamus (which acts as some sort of sensory filter - the reason why you get used to the feeling of clothes on your body once you put it on, for example) which is something that I'm not too sure if I can to do. Anyway, given the current work on bionic ears and bionic eyes and limbs I'm not too worried about the inputs and outputs for the brain. If I were to worry about would be the "keeping the brain alive" bit since there doesn't seem much to be going on (unless you count full body transplantation, which I read a paper seem to work on mice - but that's hardly a "mechanical" body) in that area.